Crystal blue water and beautiful pink sandy beaches, this island nation is surrounded by gorgeous reef and abundant marine life. 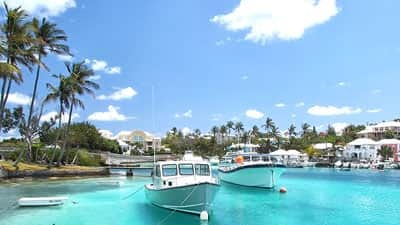 One of the world’s top diving sites, explore the gorgeous underwater playground of Bermuda, including Grotto Bay and the haunting Cathedral. The shipwreck capital of the world, dive more than 300 shipwrecks and sunken ships in the waters surrounding the island. The infamous shipwrecks of Bermuda reached their ill fate due to the hidden coral reefs spanning 200 miles (over 300 kilometres) around Bermuda, although many believe it is the influence of the mysterious Bermuda Triangle. Wander the quaint town and pretty pastel buildings of Hamilton, the epicentre of Bermuda and visit the unfinished Church of St. George’s. Explore out the crystal fantasy caves, a series of subterranean tunnels and passageways carved over 30 million years ago.